1 What's the matter in the Earth system? You are the matter! In fact, all living organisms and nonliving substances are matter. Matter, anything that has mass and takes up space, cycles through our Earth system continuously. A system is an organized group of parts that work together as a whole. Our planet has four major spheres or parts- the biosphere, the hydrosphere, the atmosphere, and the geosphere - that make up the Earth system. Before we cycle through the spheres, let's talk about systems in general. 2 A system is a combination of parts that work together and form a complex whole. All systems have energy and matter that move through them continuously. However, the movement of energy and matter within a system varies. In a closed system, only energy flows into and out of the system. Matter in a closed system does not enter or leave. Earth is a closed system, and so are terrariums. In open systems both matter and energy move into and out of the system. Earth's four spheres are open systems. These four spheres work together to form one large closed system called Earth. 3 The atmosphere is a mixture of gases that surrounds and protects our planet. The largest amounts of gas are nitrogen (about 78 percent) and oxygen (about 21 percent). There is also water vapor, carbon dioxide, and smaller amounts of other gases. Our atmosphere works together with other spheres to form our planet's weather patterns. When the cold and warm ocean currents in the hydrosphere combine with the winds from the atmosphere, we see a change in our weather. 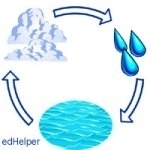 Let's look at the Earth's water cycle. It occurs in our hydrosphere and atmosphere and produces precipitation. 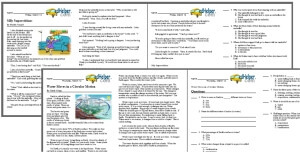 Our hydrosphere includes all of the oceans, lakes, glaciers, surface water, and ground water on Earth. About 71 percent of the planet is covered by water. You might be amazed to know that only 3 percent of our water is fresh and drinkable. The majority of our water is salty ocean water that is not good for drinking. Of that 3 percent of water on Earth that is drinkable, nearly all of it is frozen in glaciers or ice caps or is trapped underground. Only about 0.3 percent of Earth's freshwater is found in lakes, rivers, streams, and swamps.